Jill Bliss is in the middle of moving but that hasn’t stopped her from decorating. Inside her home-in-progress on Lummi Island, walnut-sized barnacles stuffed with succulents sit in a dish atop the kitchen counter. Spiral shells and chunks of driftwood adorn the bathroom windowsill. Out front, feathers and sea-smoothed rocks fill the dashboard of her cargo van. For the past five years, her travels, as well as her artworks, have concentrated on the San Juan Islands she calls home. Bliss’s art reflects her natural surroundings, and she’s never short on inspiration. In winter, she studies plants and animals to paint depictions of them in their natural habitats—moon jellyfish glimmering in dark starry waters, orcas silhouetted with kelp beds and schools of fish. 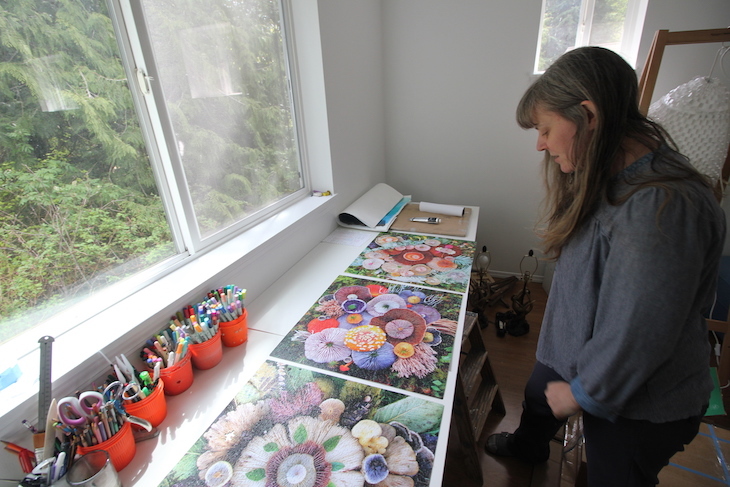 In summer, she sells prints at the Bellingham farmers market and applies her knowledge as a self-taught naturalist on a whale watching boat based in San Juan Island’s Friday Harbor. 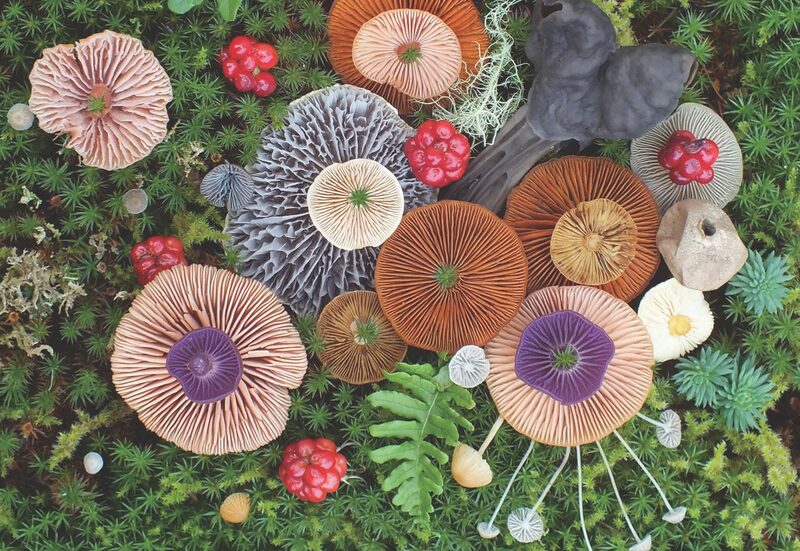 The foraging that informs her décor also forms the basis for her series of “nature medleys,” ephemeral, mandala-like in situ displays. 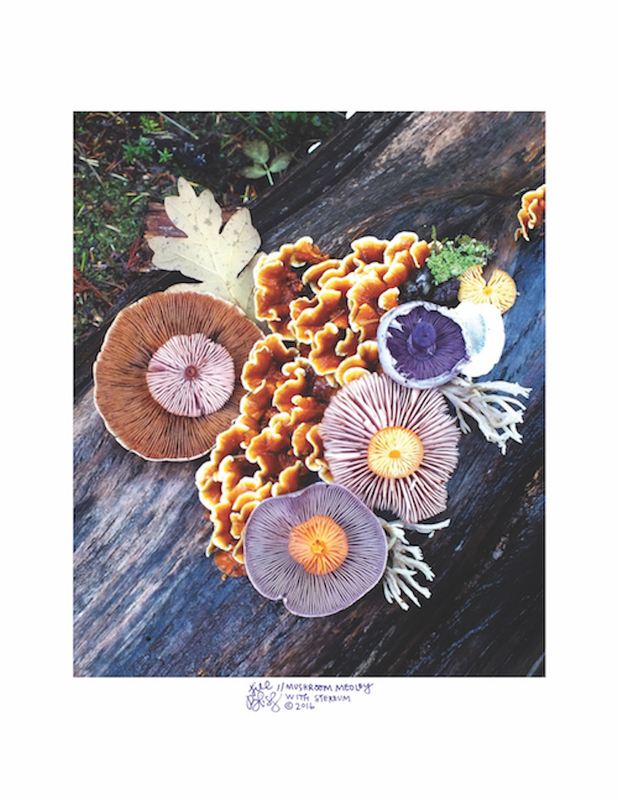 After a walk through the local forests or tidelands, Bliss will choose a stump or other untrodden area on which to arrange and photograph her findings, using fungi and fern leaves to create vibrant natural studies in color and symmetry. Upstairs in the unfinished studio are crates of postcard-sized prints and three blown-up puzzle versions of her most colorful medleys. Their minute details demonstrate Bliss’s intimate knowledge of the flora and fauna of the Puget Sound, enough to acquaint one to the landscape without even visiting. After selling her home and possessions, Bliss turned to friends for cheap, remote places to rent along the West Coast. A former instructor offered work as winter caretaker for his off-the-grid, boat-in home on Cortez Island in British Columbia. She stayed for six months. She found similar scenery and further caretaking work in the San Juans, using friends’ boats to ferry art supplies between temporary homes on Waldren Island, Decatur Island and others. With its year-round population of more than 800 and access via a tiny Whatcom County ferry, Lummi is an upgrade in civilization for Bliss. Bliss says centering her life and work on the Salish Sea bioregion has provided all the inspiration she needs. 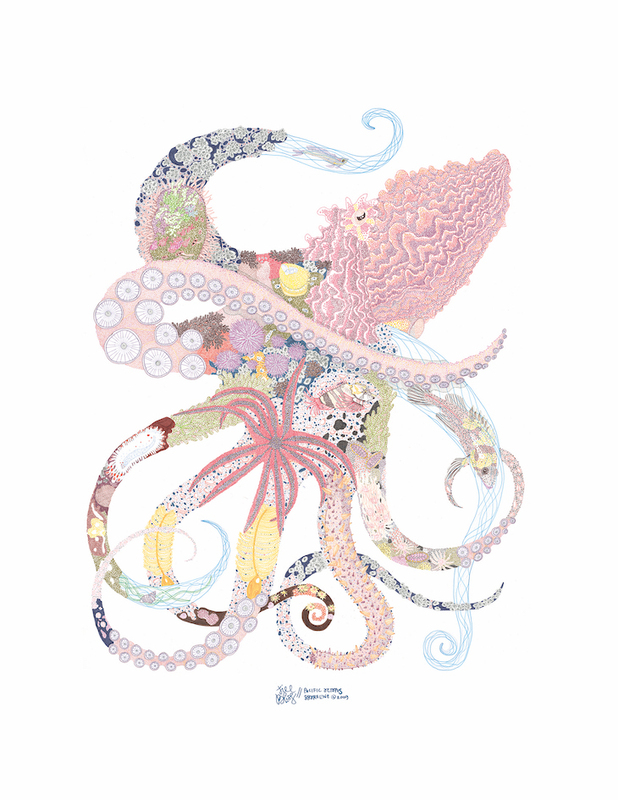 Habitats vary and evolve on biologically distinct islands within the archipelago, and her work depicts the disparate plants and animals that come together to create the ecosystem. 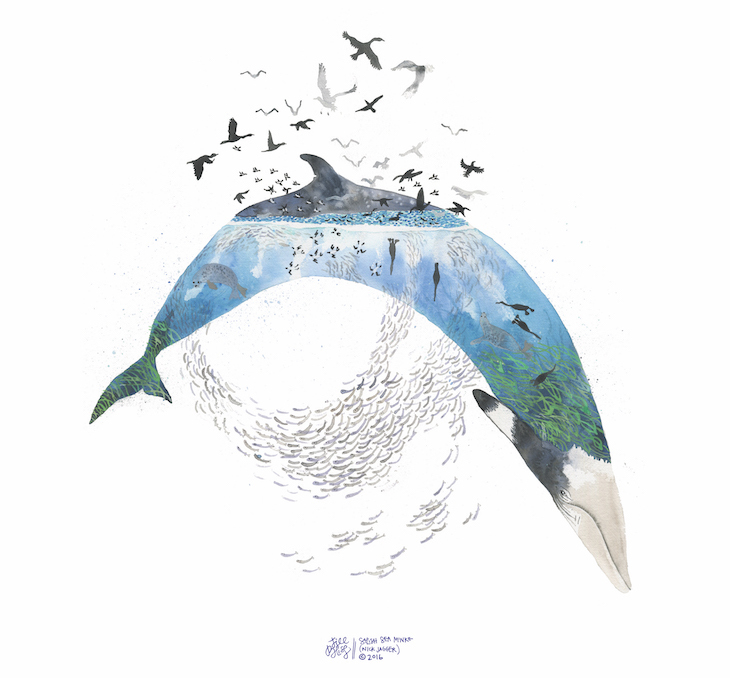 She’s been commissioned by environmental organizations like Kwiáht and the Puget Sound Restoration Fund (PSRF) to paint animal habitats based on their research on kelp beds, Minke whales and more. From the rocky beach near her home, Bliss points out and names wooded islands visible through the fog. Within the next couple years, she hopes to develop and host her own weeklong art and nature workshops on nearby Decatur Island. Now, with the weather warming to spring, she’s preparing for a seasonal shift much like the plants and animals she paints. At the farmers market or while whale watching, she’ll spend the summer sharing her work with others and relating her studies of nature to urban, human-centric systems. “There’s such a disconnect between how a lot of people live versus the natural world they live in,” she says, “and even this idea that we’re not even a part of our natural ecosystem.” To illustrate and emphasize interconnection, Bliss will incorporate humans in an upcoming series of animal habitat paintings. And she’ll continue working at the overlap between artist, naturalist and caretaker within this island ecosystem.